Fleas can never survive this highly effective topical. Always works! No complaints! Recommended! I have been using this product for over ten years, and have consistently been impressed with it doing what it says it does. I have tried three other products at different times over the years because they were a little cheaper, and each time I have returned to Frontline Top Spot. I also use this product on my dog. 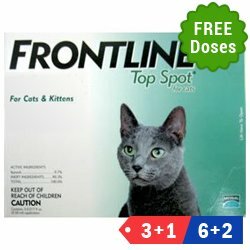 It protects my cat from fleas and ticks for one month so I dont have to worry till one month to remember and apply the treatment. At best vet care, it's always great prices and good product. Using since 5 years, and still now no issue with this treatment. It goes well with Lucy and I am happy that she never suffer from flea infestation as I use this treatment regularly. And I like buying at bestvetcare as I get free shipping.